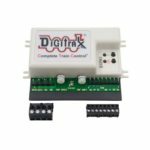 The 21 MTC adapter board is suitable for digitising a loco without interface and for the case you do not intend to wire the decoder freely. The adapter board offers a possibility for installing a decoder with 21MTC connector. This decoder is simply plugged onto the board. At the other end 21 annular rings make a clean wiring of your loco possible. A neat conversion can be made via this adapter board and enables you to use all additional functions of the 21MTC connector (e.g. loud speaker outputs).